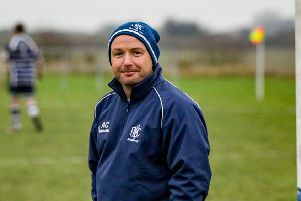 Boston Rugby Club ended their Midlands 4 East (North) season with an emphatic seven-try victory over local rivals Skegness, writes John Fletcher. Ending their league campaign on a high, the Blue and Whites secured fifth place in the league and earned the local bragging rights in front of a large vice presidents crowd. In a cagy, tense opening 10 minutes neither side created any scoring opportunities and it would take a penalty from Matt Bray to open the home side’s account. Jaron Cowern scored Boston’s first try through a well-executed move on the blind via number eight Will Scupham and srum half Josh Cook. A Bray penalty was quickly followed by a try from captain Lewis Eldin, showing good support from another Cowern break, to enter half time 16-0 with 14 players due to a yellow card picked up by Cowern. In the interval, coach Ashley Coates brought on John Hummel for Dan Piggins. Boston made the perfect start five minutes into the second half, number eight Scupham, charging down an attempted clearance from inside the dead ball area to score the team’s third try, converted by Bray. Cowern scored his second try of the match, Bray converting and moving the score to 30-0. It was at this stage that coach Coates emptied the bench to give his replacements game time. Boston would score three further tries, via flyhalf Matthew Bray, Winger Kyle Turley and prop Alex Hough, to seal the derby victory and start the end-of-season celebrations. Boston’s man of the match was winger Jaron Cowern. BOSTON: Hough, Beard, Griffin, Sharpe, Eldin, Fowler, Scupham, Cotton-Betteridge, Cook, Bray, Baldwin, Woods, Hobbs, Piggins; Replacements: Hughes, Hall, Turley, Deamer, Coley, Hummel.